This last weekend my wife and I decided to go to the movies, something we realized we hadn’t done in a long time. 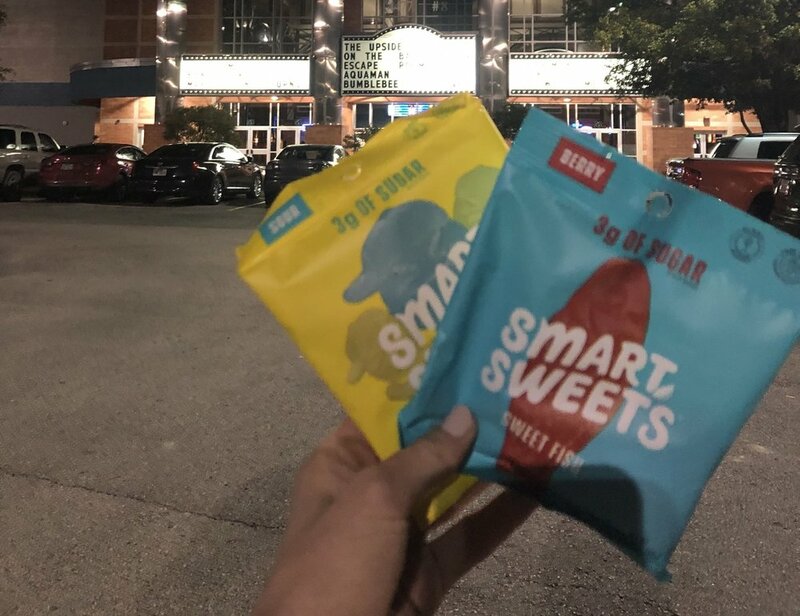 Since my wife just started her own keto journey, we set out to find some good keto snacks to bring to the movie theater. At Whole Foods she stumbled across Eat Smart Sweets, which are low sugar gummy candies that are pretty popular in the low carb space. I had heard some things about this product but I figured we could give it a try for ourselves. Of course, I decided to turn this into a self-experimentation opportunity and tested my blood glucose. Spoiler alert, the blood glucose response was not good, and either was the movie (we saw The Mule). I chose to do the ingredient review before getting to my blood glucose response because I want to emphasize that blood glucose response is not the only thing you should be using to determine if a product is healthy or not. Just because you can stay in ketosis eating a food does not mean that it is optimal for your overall health. This is why ingredient reviews are important. I have found that tapioca fiber is hit or miss for me. Some products I have tested with tapioca fiber have produced no glucose response while others have produced massive responses. It is possible that the ingredients that are paired with this ingredient may impact its absorption and digestion by the body. To learn a little more about this, I reached out to my buddy Andrew Barninger, a.k.a. The Performance Chef who is a wizard in the world of food chemistry and especially fiber. Chicory root fiber is a soluble fiber that absorbs water and forms a gel in the gut. It is a source of inulin and fructooligosaccharides. This is a commonly researched fiber that is safe, doesn’t seem to cause a big spike in blood glucose, and typically does not cause side effects UNLESS consumed about 5g. Eat Smart Sweet has 33g of fiber. It does not tell you how much of that fiber is coming from chicory root and how much is coming from tapioca fiber but since chicory root fiber is the 3rd ingredient, I would have to speculate it is more than 5g. Chicory root fiber is not used as often in food products anymore because after a few months it hardens. However, for a gummy snack like these, that may be a good thing. Gelatin is a food ingredient that is derived from animal collagen that should be okay. The problem is that the source matters. Poor food manufacturing practices could lead to the contamination of this ingredient. I am obviously on board for coconut oil and happy to see any product not using vegetable oils! Round of applause here. Note that the amount of coconut oil used in this product is probably not enough to provide much benefit though. I didn’t know what this was but after a quick google search I found that it is a wax that comes from the leaves of the palm Copernicia prunifera . This wax is commonly used as a food additive to provide a glossy finish. It is also used to provide the same effect in car waxes, shoe waxes, and dental floss. I did not dig too deep on this ingredient but there seems to be some debate about the safety of this product. Regardless, to me it seems like a food additive that most optimally would be avoided. There are only 2 1/2 different types of sweeteners that I am cool with. I think stevia and monk fruit are the two best and so far I think erythritol may be alright but I need more convincing. The problem with sweeteners obviously is that they are sweet and while stevia should not have an impact on blood sugar, it can still stimulate some cravings which should be considered when looking into keto snacks. But as a whole, great work by this company for using stevia. Carrageenan is another food additive that is commonly used to help emulsify and preserve foods and drinks. This is a food product that I mentioned briefly in my review of the Bang Keto Coffee and nothing has changed, I still do not like this ingredient. While this ingredient is approved by the FDA, there is not enough human evidence to determine if it is actually safe or not. It is reported that this ingredient could cause gastrointestinal distress by destroying the mucosal membranes in our intestines, making our guts more permeable, a.k.a. leaky gut. This coupled with possible inflammation and promoting insulin resistance is enough for me to want to stay away from this ingredient! As you can see guys, this product led to a HUGE increase in blood sugar. I am not sure what exactly caused this but after talking to more folks in the keto-space, I think its evident that these are not a keto-friendly alternative. I was going to make my next test be comparing this to actual Swedish fish but since I am in the process of finishing up a book and I want to maintain my cognitive function, I’m not sure I want take another knock at my blood sugar levels yet! I have no intentions of developing any bad relationships with anyone but I think it is important to highlight these findings for people who are very serious about keeping your blood sugar low. If you are not as serious about this, then yes these MAY be a good alternative to full sugar gummy bears because they taste great and dont contain sugar! However, if you are paying attention to your blood sugar, as many should be, especially keto dieters, this product is a hard no. Blood glucose is much more important to me than ketone levels so I will be keeping this product off my list.